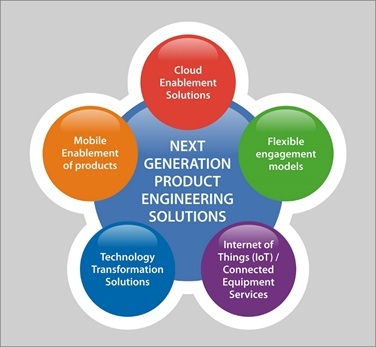 Next Generation Product Engineering Solutions from ZenFocus help you with your technology transformation needs to launch products much faster in the market. Software product companies continue to adopt new technology forces like mobility, cloud, Big Data, analytics, social and Internet of Things (IoT) to transform their product experiences, reduce operational costs, and target new opportunities and markets. Recognizing your needs, we, at ZenFocus, offer not only end-to-end product engineering services but also next generation technology and domain solutions. Mobile Enablement of Products: We offer comprehensive solutions in the mobility space to help you extend your products for mobile devices. This enables you to develop completely new products or applications and leverage the mobility features in the products and providing seamless user experience across devices. We also offer you consulting with your mobility strategy, mobile product development, automated mobile testing and creating an enhanced user experience. With a strong team of mobility and user experience experts, our product engineering capabilities and mobility labs, ZenFocus is positioned to become the mobile enablement partner for your products. We also provide you with niche solutions in automated cloud data management interface compliance. We, at ZenFocus, have focused on developing dedicated teams in Mobility, Big Data, Social networking, Analytics and Cloud computing. This enables us to manage your technology transformation requirements of the products in an efficient manner while you concentrate on your core business processes. We have built flexible engagement models at the product, product line and product portfolio level with attractive pricing options. These models help you focus on cost reduction, talent retention, quality improvement, faster time-to-market and increasing the operational efficiencies of day-to-day activities. With ZenFocus alliances with leading industry players (chip companies, module manufacturers, M2M platform providers, communication service providers), and an understanding of industry and business process, we are in a unique position to help you quickly build your vertical IoT solutions and services.